Many people in the Filipino community in Southern California have some connection to him, whether they served with him, marched with him, protested with him, organized with him, or were simply inspired by him. I’m honored to have been a co-worker of his. I took this picture of Baclig in 2002 at the Historic Filipinotown dedication at L.A. City Hall. I worked with Baclig circa mid-1990s at a nonprofit group called Filipino American Service Group, Inc. (FASGI), which largely served Filipino seniors. 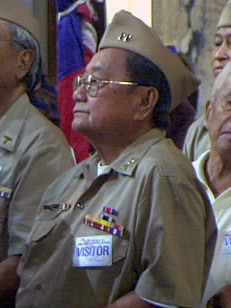 I worked as the organization’s communications coordinator, and Baclig was one of a handful of Filipino World War II veterans who worked at the agency, doing various tasks. But by far the biggest task was lobbying and organizing to call attention to the issue of Filipino World War II veterans – namely the fight to earn the veterans’ benefits promised to them during wartime that they never got. Baclig was a true soldier both in war (having survived the legendary Bataan Death March in 1942) and long after the war as well. Baclig, or “Mang Peping” as many called him, was admired and respected by those from the younger generations as well. A few of my filmmaker friends have even cast him in movies and music videos. 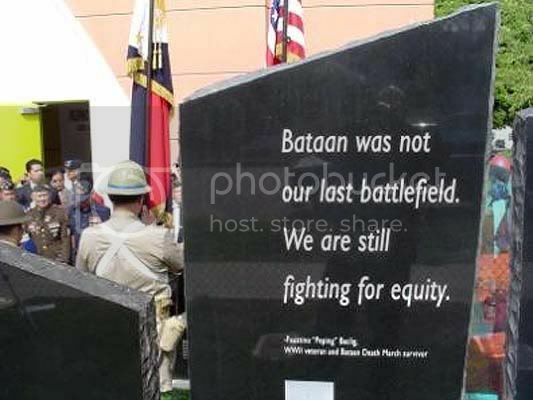 A quote of his is – quite literally – written in stone at the Filipino Veteran’s Memorial in Lake Street Park in Historic Filipinotown. And he was easily visible in media soundbites concerning Filipino veterans. Simply put – he was The Face of the Filipino World War II Veteran. 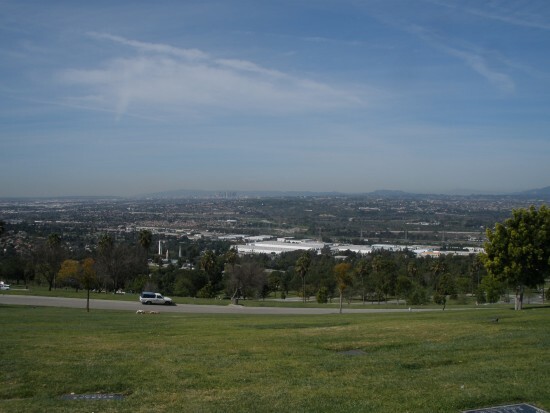 Around 100 people were in attendance at Whittier’s Rose Hills Memorial Park (in the Autumn Terrace section) to bid Baclig their final salute, under an uncharacteristically sunny and warm Winter day. 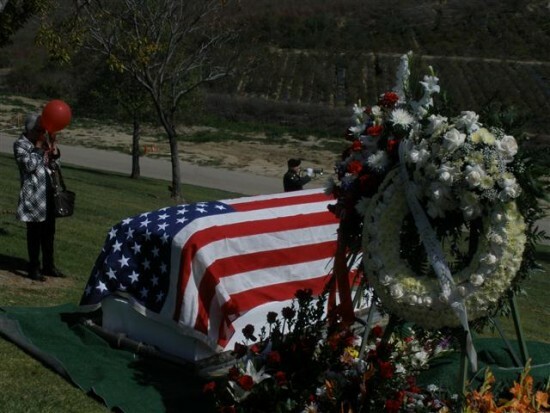 A flag-draped coffin, a bugle playing “Taps” and the presentation of the folded flag to the deceased’s widowed survivor are usual traditions at the interment of one who served in the armed forces, usual enough to take for granted. But this was different. From the very moment I saw the flag-draped casket being brought to the burial site, my eyes uncontrollably welled up in tears. It was completely symbolic of what he fought for in the past few decades. And perhaps it was also a symbolic message for other Filipino Americans like myself (or even anyone else from an immigrant background) to not take “the usual” for granted, because, even though we are still struggling and wanting, we still have much more than what we used to have. Nothing we have ever done was futile. 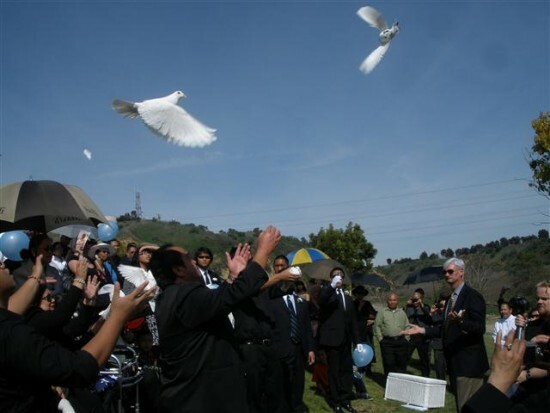 Homing doves are released by family members. 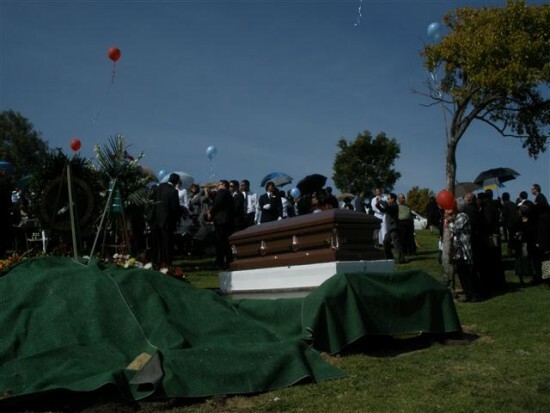 Around 100 bid their last goodbyes to Baclig.